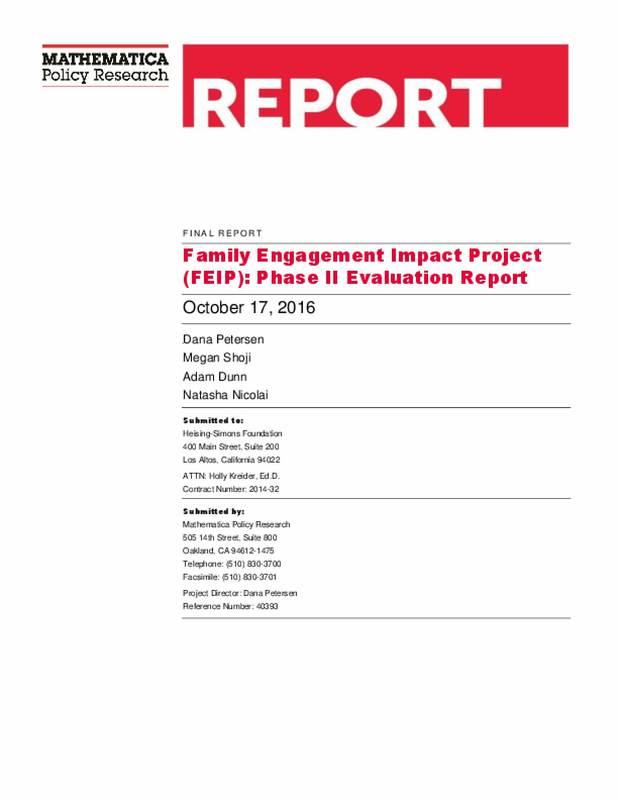 In September 2013, the Heising-Simons Foundation (the Foundation) launched a new initiative called the Family Engagement Impact Project (FEIP). The purpose of the initiative is to offer new ways to build capacity for family engagement to promote positive educational outcomes for low-income immigrant children from birth through age 8 in California's San Mateo and Santa Clara counties. The initiative leverages existing resources and strengthens public-private partnerships in order to coordinate and integrate efforts across organizations in the funded communities. The partnerships' efforts focus on building the skills of parents and professionals, with an emphasis on enhancing family engagement at home. The FEIP also supports partnerships in replicating at least one evidence-based family engagement model. The Foundation awarded 8-month FEIP planning grants to six communities (Phase I) in fall 2013. During this phase, the selected communities secured partners, defined their family engagement goals, and planned strategies and approaches to achieve their goals. In June 2014, five grantee partnerships received 24-month implementation grants (Phase II). During this phase, the partnerships were tasked with implementing the plans that they had developed during Phase I, including delivering coordinated family engagement programming in their geographic focus areas and implementing at least one evidence-based family engagement program. Table ES1 provides an overview of the five grantee partnerships that received Phase II implementation awards, including the grantee lead, the geographic area served, and the key activities and programs offered by the grantee partnerships. Copyright 2016 by Mathematica Policy Research, Inc.. All rights reserved.